As we surround ourselves more and more with screens, from our phones, our computers, our tablets, and our televisions, we’re exposing ourselves constantly to what is known as blue light. This artificial light not only impacts our ability to get complete, restful sleep, but it also can degrade our eyesight over time. The most common solution people have found are glasses with orange or amber lenses, designed specifically to filter out this light and protect our eyes. In this article, I’m going to first cover what the best blue light blocking glasses you can buy are, and then we’ll go in-depth into what blue light is exactly, and why we want to protect our eyes. Alright, first let’s take a look at the 5 best pairs of blue light blocking glasses you can buy in 2018. If you’re interested in learning a ton more information about blue light, and why you might want to protect yourself from it, go ahead and skip past the reviews. Although these are not the only things I took into consideration, they are certainly some of the main things we want to think about when ranking which glasses are best. Since these type of glasses are becoming increasingly popular, there are a lot of new companies entering the market. Many of these are poor quality imported glasses that do not protect the wearer nearly as much as the company may claim. I tried to only list quality glasses that will actually provide the protection they claim to. Because of this, there will be a bit of a gambit of prices on my list, with some being much more expensive than others. Although for a casual wearer, an inexpensive pair may be all they need, I really feel that with blue light blocking glasses, you sort of get what you pay for. The team over at DefenderShield sent me a couple pairs of these glasses when they first released them. I had tried blue light blocking glasses in the past, so I was a bit skeptical about these considering they are a fair bit more expensive than your average pair on Amazon. However, these glasses are actually really amazing. In fact, I’m wearing a pair right now as I type this. Let’s talk about some of the reasons these are currently my #1 pick for blue light blocking glasses. Most of the cheap pairs of blue light blocking or filtering glasses on Amazon have really cheap feeling frames. They remind me of the free reading glasses you’ll sometimes find at restaurants. The glasses from DefenderShield are really high-quality acetate frames that are hypoallergenic, and although they are very light-weight, they are very sturdy and built to last. There are three different frame styles to choose from, their “signature” which is the first image on the right, a simple black frame, and a sort of orange and black tortoiseshell style that I really like. I think the lenses are where the DefenderShield glasses really stand out. 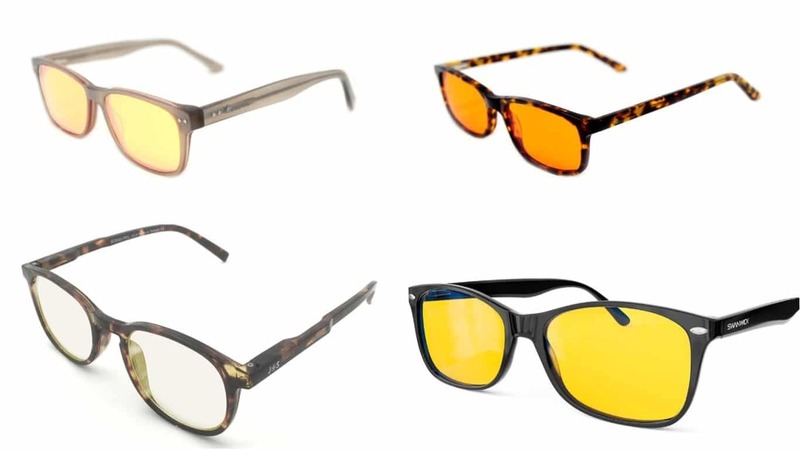 First of all, there are two different lenses to choose from, the yellow, and the orange, each offering different levels, and styles of protection. Both lenses filter out 100% of UV light. Both lenses are also CR-90 and are very lightweight as well as shatterproof. 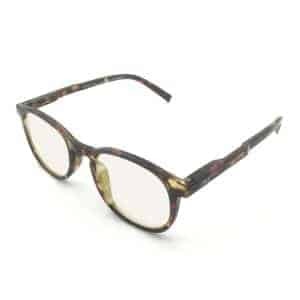 These are intended primarily for daytime use especially for casual viewing of screens. For example, watching television during the day, working on a computer at work, use with phones, tablets etc. 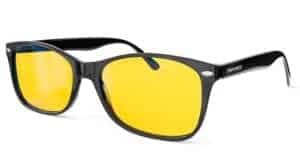 Essentially, if you spend more than an average amount of time looking at screens during the day, with the lights on, these are the glasses for you. Although they are less extreme at blocking out blue light, that is actually preferred when you are working with the lights on, during the daytime. 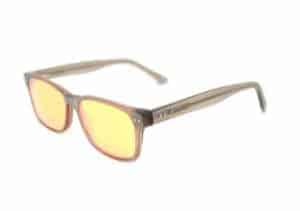 These are also a great choice for daytime gaming on your computer or on your television, as they will not distort the image hardly at all, while still protecting your eyes. 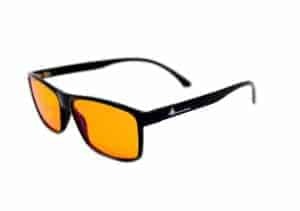 The orange lenses offer more protection and filter out 99% of harmful blue light. These are ideal for use at night, especially before bed. So if you often scroll through your phone, binge watch one more episode of a show, or work on your laptop right before bed, these are perfect for you. As we’ll talk about down below, blue light shortly before bed really impacts your ability to get complete and restful sleep. So the orange lenses from DefenderShield really help to protect your bodies ability to get good sleep. These glasses are also fantastic for use after operations on the eye, as they dramatically reduce vision strain. They may even help to prevent the risk of glaucoma and premature macular disease of the eye. You can get a visual of the different lens types in the images to the right. You’ll see the yellow lenses in the first pair, and the orange lenses in the other two pairs. The lenses have an anti-glare coating, that works extremely well. If you work on computers often or play video games, you know that without this the glare can actually be really distracting and frustrating. The lenses also have an anti-fatigue element to them, that help to keep your eyes from getting overly tired while working late into the evening. They come with a nice cleaning cloth, as well as a fantastic little carrying sack made of a material you can use to clean the glasses as well. Overall I was extremely impressed with the quality of DefenderShield’s series of blue light filtering glasses. I love that you can pick not only the frame but how much light the lenses filter. I really like the overall quality of the glasses, and finally, I like that they come from DefenderShield. 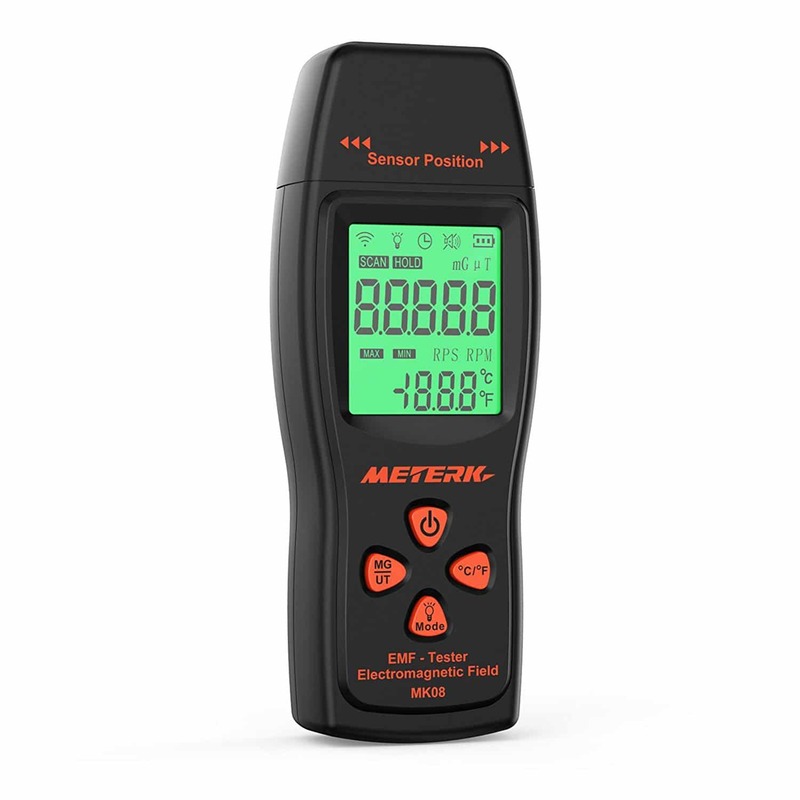 I’ve gotten many of their products in the past, and am always impressed with their customer service, return policy, and just product quality in general. If you’re interested in picking up a pair, you can get them right here. This is my favorite pair of blue light blocking glasses that you can get on Amazon. They are a really nice mix of quality and affordability. Although there are cheaper glasses on Amazon, I think that these are certainly worth the few extra dollars they cost. If you aren’t going to opt for the more expensive pair from DefenderShield (and I would totally understand, they are quite a bit pricier) then this is the pair that I would go for. They are an extremely attractive pair of glasses, with a nice frame and quality lenses that provide a ton of the benefits you should come to expect. First of all, the lenses block 90% of blue light, which is really great. It is not quite the 99% that the DefenderShield orange lens blocked, but that isn’t necessarily a bad thing, depending on what you’re getting them for. These are designed to provide a large amount of blue light protection, while also allowing for very minimal color distortion that you may expect from these type of glasses. The frames themselves are very sturdy and feel really quality. They are designed to work and be attractive for both men and women. They are a little bit heavier than some of the other glasses on this list. This helps them to feel even sturdier, however, some people don’t love the feeling of slightly heavier glasses on their face. Overall I think the J + S blue light filtering glasses are completely fantastic for the money. You’ll notice on the Amazon listing that the reviews seem to match up with my experience. Although these may not be the absolute best blue light shielding glasses on the market, they are potentially the best value available anywhere. If you want to purchase a pair or check the price, you can pick them up on Amazon. This is not my favorite looking pair, and although they are a little bit higher quality than the J + S pair I talked about previously, they are more than double the price. So at this price point, I would highly recommend you consider getting the pair from DefenderShield. However, these are still really high-quality blue light blocking glasses with fantastic specs and even better reviews. So although I’m not sure they are as good of a value, if money isn’t really a consideration for you, these might be a good option. Let’s talk a little bit about some of the features and specifications of these glasses. First of all, just like the DefenderShield glasses, the Swanwick (or Swannies as they affectionately call them) pair is also made out of Acetate frames. These frames are very strong, lightweight, have some flex, and are also significantly friendly to the environment than other frame materials. I really like the look of the frames overall. They have a simple black frame, as well as a tortoise shell look that I like. They don’t say exactly what percentage of blue light these lenses filter out, but I think it is quite high. Some of the people who reviewed the product said they were extremely impressed with how much, and what types of, blue light the glasses filtered out. The orange lenses are also non-reflective and anti-glare which is great. Swanwick Sleep, the company that makes the glasses, is registered with the FDA and has many products that are approved, so that may give you a bit more trust. They have also sold an absolutely enormous amount of pairs of these glasses, and have outstanding reviews, so people are obviously quite happy with the product in general. The Swanwick Sleep blue light blocking glasses are certainly one of the nicer pairs on the market, but for the relatively high price, I’m not sure they are the absolute best value. However, if you don’t like the pair from DefenderShield, and want to get a higher quality pair with better components, then these are the glasses to go for. If you’re looking to pick up a pair, you can get them on Amazon. I wear glasses most of the time. So although the blue light blocking glasses I listed in this post are fantastic, they aren’t the best for everybody. 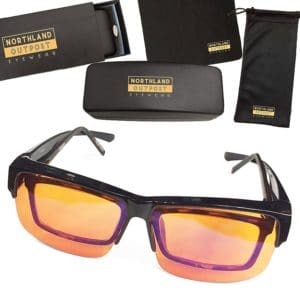 This pair from Northland Outpost is designed specifically to be worn over the top of the glasses you are already wearing, which I just think is fantastic (Note: the glasses are designed such that they can also be worn on their own as well). 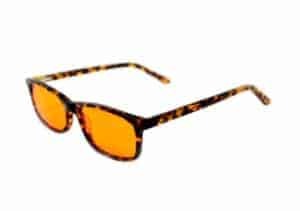 The amber lenses that the glasses utilize block 95% of blue light (but will add a bit of discoloration, which is always a cost you pay for higher levels of protection). The frames are borderless and extra large, which can make for a nice viewing experience when you’re watching TV or gaming. They also have nice anti-glare lenses that help to prevent eye strain. The glasses come with a nice hard storage case, a cleaning cloth, and a soft storage bag as well. This is nice because the glasses feel a bit delicate since most of the frames are borderless. They offer what they call their “fab fit guarantee” (I know, I don’t like the name either) which essentially just means that if for any reason you’re not satisfied with the glasses for any reason (including the fit) you can return them. Overall I think these are the best blue light blocking glasses on Amazon for wearing over the top of your existing glasses, and I think you can see that most people agree when you look at the number of 5-star reviews for the product. The price is also extremely reasonable, much lower than the highest quality pairs, but a bit more expensive than the cheapest pairs around. If you want to pick up a pair, you can get them on Amazon. I had to add at least one very cheap pair to my list. The Gamma Ray Optics glasses are extremely affordable, and out of the inexpensive pairs on the market, I believe are the highest quality. The manufacturer says that the stock lenses that come with these glasses block 97% of the blue light, so expect a good amount of color distortion. However, this will make these glasses a fantastic choice to use before bed while you’re scrolling through your phone or watching television. The frames feel kind of cheap, as they are just made out of a simple black plastic. However, they are very light-weight, come with spring hinges, and are a unisex design. They do come with a nice little carrying case and cleaning cloth, as well as adjustable nose pads. Overall these are just a simple pair of blue light blocking glasses, that is great if you’re just looking for something inexpensive to throw on every now and then to protect your eyes from the damage caused by the devices you use. Alright, now that we’ve looked at the 5 absolute best blue light filtering glasses you can buy in 2018, let’s go a bit deeper into what blue light is, why it’s dangerous, and what we can do about it. You’re exposed to Blue Light all the time, from your cell phone, your iPad, your television, even some of the lamps in your home. Although traditional incandescent light bulbs don’t expose you to much blue light, newer LED light bulbs do, increasing our exposure to this light all the time. It’s important to remember that “blue light” doesn’t always appear blue, but instead refers to the wavelengths of light between 400 and 495 mm, corresponding to the color blue on the visible light spectrum. Take a look at the image below to get a visual of where blue light falls on the visible light spectrum. The screen you are looking at right now, whether it is on your computer, your tablet, or your cell phone may appear to be emitting a bright white light, but the spectrum of light that is hitting your eyes is primarily blue wavelengths. The primary reason that you’re exposed to blue light so often these days, is that screens are primarily lit with ultrathin LED (light-emitting diode) lights. This type of lighting source is tailor-made for today’s devices because it is so thin and bright. LED light bulbs are also significantly more energy efficient, and last much much longer than traditional incandescent bulbs. LED light bulbs have a ton of benefits, which is why we see them used in nearly every kind of device today. For the most part, this is a very good thing, however, there are a few drawbacks to this type of light. Now let’s talk a little bit about when Blue Light is dangerous, and when it isn’t. Why Is Blue Light Dangerous? So when we’re talking about the dangers of blue light, we’re primarily looking at our exposure to it at night, especially leading up to bedtime. The primary harm of blue light exposure before bed is a suppression of melatonin release, which is the hormone that regulates sleep and wakefulness. This not only impacts our ability to get complete and restful sleep but also can throw off our circadian rhythm. The circadian rhythm is our bodies internal clock that determines when we naturally get tired and is very important to our overall health. Although these are not completely proven, and may largely be a result or worsening sleep patterns caused by the blue light, there is some experimental evidence that our risk may be increased. There are also dangers to the longevity of our eyes from prolonged exposure to blue light. You may have noticed that staring at a bright screen late at night really can strain your eyes and make them ache a bit, this is a sign that they are not being protected. Wearing blue light blocking glasses like we talked about in this article will help you to notice how dramatic this effect can be. While wearing the glasses, you’ll likely notice your eyes feel far less strained. 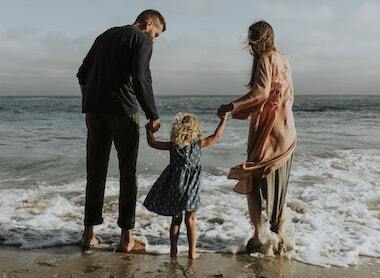 In one review of multiple studies, the Molecular Vision Journal found that there is reason to believe that exposure to blue light may slowly erode our photoreceptors. With time, this can cause many health issues in relation to our eyes. How Can We Protect Ourselves From Blue Light? Although exposure to blue light can be harmful to our eyes, especially when viewing it at night, there are quite a few things we can do to protect ourselves. Fewer Screens – The best thing you can do is reduce the time you are looking at screens, especially right before bed. It’s an easy habit to check our social media or look through a few last emails right before bed. However, doing so can really impact our ability to get restful sleep. Turn The Lights On – If you are going to look at your phone or laptop late at night, turn a light on. Viewing these screens in complete darkness dramatically increases the strain on our eyes. Blue Light Filters – Many devices today have ways to filter out blue light built in. For example, I have an iPhone. You can set what is called “night shift” to turn on automatically from sunset to sunrise. This will automatically filter out the blue light during the most important hours. Many other devices have similar settings built in, if not, there are likely free apps you can find to do the same thing. Blue Light Blocking Glasses – Finally, you can use quality blue light blocking glasses to protect our eyes during the day, and especially at night. In fact, right this moment while I’m typing this article, I’m wearing a pair of DefenderShield’s blue light blocking glasses. I hope you enjoyed my guide to blue light blocking glasses, if you did, please consider sharing!